A tablet (also known as tablet computer or tablet PC) is a mobile computer with touchscreen display. Touch screen display is much easier to use that keyboard and mouse/mousepad in regular computers and laptops, and thus tablets are great for those who have not previously used a laptop or PC. Tablets come with an integrated wireless technology built in: wi-fi, bluetooth or mobile Internet. Most have a microphone, speaker, GPS, camera and gyroscope. Compared to a laptop, power consumption of tablet PCs is very low, so they can be used for a long time on a single charge. Their popularity also lies in their light weight and compact size. An important question that many people ask is whether they really need a tablet. With a laptop you can do much the same things. A tablet has a number of advantages over a laptop including the touchscreen control, size and weight. You can easily scroll through websites and surf the Internet, play videos, read books, zoom in on photos and more. This type of interface is called ‘intuitive’, which is experienced by many people as natural. The tablet is great for activities on the go, and in particular for media consumption. 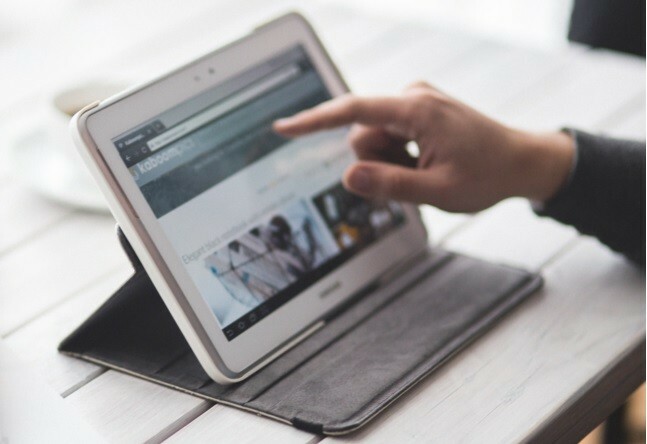 Surfing the web is easy on a tablet with your home network (Wifi) or your mobile service (3 g/4 g) connection. Also the social networks (Twitter, Facebook) are fully integrated into tablets – you will most likely find them pre-installed on the device. The screen of a tablet PC is large enough for most websites. The image quality of the latest tablets is similar to the quality of a laptop or desktop PC. It goes without saying that it’s uncomfortable to watch a movie on a tiny smartphone display, but a tablet is a perfect size to watch a video somewhere on the train, plane, or in the garden. In addition, many tablets can be connected to TV so you also can view a movie on a large screen. Tablets have several options for you to store and display photos. You can load pictures with a SD card or USB connection, but usually it’s also available via Wi-Fi. With your fingers you can easily scroll through the pictures, zoom in on and rotate photos. There are more and more games for tablets. This varies from simple to complex games where you can spend hours. Of course, this can also be done on a laptop or PC, but tablets are more mobile and can add a new dimension to games. For example, you can use the motion sensor in some tablets, for example for playing racing games. There are programs that allow users to read books in digital format on tablets. A great advantage is that you can save thousands of books on your tablet and read when and where you want. There are now sufficient applications available to work on your tablet. Think of sending emails, editing Word files, reading PDFs, making PowerPoint presentations, updating and synchronizing your calendar, etc. In addition, you can use an optional keyboard to type long texts without problems. Apple’s iPad, Android, Windows Tablet or Amazon Fire? The tablet you choose depends on what you want to use it for. The 7-8 inch models are very popular – they are large enough even for videos, yet very easy to hold and carry around. The battery life is important. The battery should last at least eight hours. The possibility to browse the Internet via UMTS/LTE is important. This causes additional costs because you need an additional mobile radio card like in mobile phones. Powerful quad-core processors are now the standard. Although the iPad only has a dual-core processor, it is very powerful as well. Plenty is space is also useful, such as to save photos and videos on the device. An addition to the internal memory – an optional memory card is a good idea. No matter what you use the Tablet for, the display resolution is crucial. Cheaper tablets often have pixelated screens and pale colors. The resolution should be ideally 1280 x 720 pixels, but the more the better. Note that the total amount of pixels is stretched across the screen, so if two tablets, one larger and one smaller have the same resolution, the smaller one will have a higher pixel per inch ration and a higher level of detail. If you have an iPhone or a Mac, the iPad will probably be more convenient for you. If you have an Android phone and an Android tablet, synchronization is easier. If you are used to a Windows PC or laptop, Windows tablet could be a good choice. And if you are an Amazon Prime member, Amazon Fire could work very nice for you. Consider the size: 10 inch (25.4 cm) tablets allow you to watch a video even sitting further away from the screen, but they are bulkier and heavier. Talking about the weight of the device, anything under 300g is easy to hold even for hours.